In his inaugural presidential debate, Rick Perry had a choice. He could have emulated sports heroes like Charles Barkley in 1991 and Terrell Owens in 2006 and claimed that he was misquoted in his own autobiography. Instead, the Texas governor invoked the never-retreat spirit of the Alamo and bravely repeated his description of Social Security as a “Ponzi scheme” and a “monstrous lie to our kids.” That decision spoke volumes about Perry’s literary integrity, but it also may have left him about as electable as Barry Goldwater. Perry’s Ponzi scheme rhetoric can easily cause him problems in the caucuses and primaries—in addition to the obvious political burden if he ends up facing Barack Obama. The Republican voters in pivotal early states like Iowa and South Carolina are already in their Easy Listening Years. Nearly three quarters of the Republicans who took part in the 2008 Iowa caucuses were older than 45 and more than a quarter were eligible for Medicare. Two thirds of the GOP voters in the 2008 South Carolina primary were over 45. After 25 days that shook the Republican firmament, Perry went into the debate merely having to solidify his position as the poll-vault king of the presidential field. During the opening minutes of the debate, Perry seemed to be deliberately tamping down his Texas twang and rhetorical flamboyance. In fact, the only colorful thing about him was a blue tie so wide that it might have been table linen. But Perry is too irrepressible a political figure to remain on the American bland-stand through an entire debate. Before too long, egged on by moderator John Harris from Politico, Perry was going after Karl Rove: “You know, Karl has been over the top for a long time in some of his remarks.” And fresh from suggesting that Federal Reserve Chairman Ben Bernanke’s attempts at economic stimulus were “almost treasonous,” Perry suggested that Obama probably was an “abject liar” about border security. Surprisingly, the second most devastating attack on Perry came from Ron Paul, rather than Romney or the questioners. The Texas governor has come under fire from social conservatives for his short-lived efforts to vaccinate 12-year-old girls against sexually transmitted diseases. The standard right-wing critique has been that the statewide vaccination program would encourage sexual promiscuity. But Paul objected to the way that Perry unilaterally enacted this program by executive order. The implicit argument was that Perry, for all his anti-Washington bluster, is a Big Government Conservative. 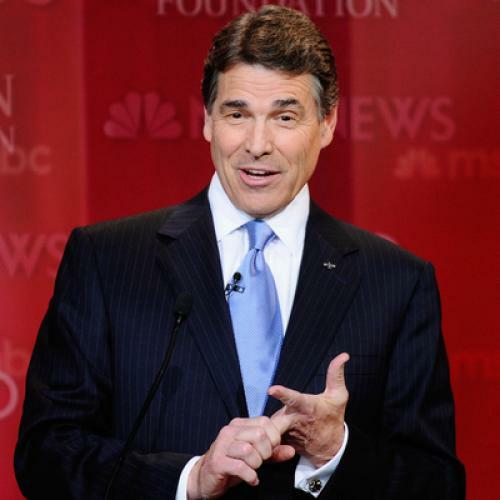 What the debate also proved was that it is hard for any candidate, even Perry, to run as the Jobs Governor. By the time that Romney and Jon Huntsman finished trumpeting their own job-creation records as governor and belittling the purported Texas Miracle, it was difficult to keep all the political boasting straight. The longer this statistical jousting continued, the more likely Republican voters were to conclude that the private sector creates jobs rather than an individual state governor. The truth is that—without any help from the media—Republicans soon will be attacking each other in a torrent of 30-second spots made possible by the Supreme Court loosening campaign spending laws. That is why the significance of Thursday night’s debate at the Reagan Library is that it took place at a moment in the campaign when the exchanges were still civil. No candidate was asked to repudiate a TV ad, nor did anyone feel the necessity to invoke Ronald Reagan’s 11th Commandment not to speak ill of a fellow Republican.